With the roadster now here in Denver, and a talented fabricator who I'll call Mr. T on the case, the roadster will soon be having its 9" rear suspended to the frame. We're looking at creating a four link suspension system for the back. 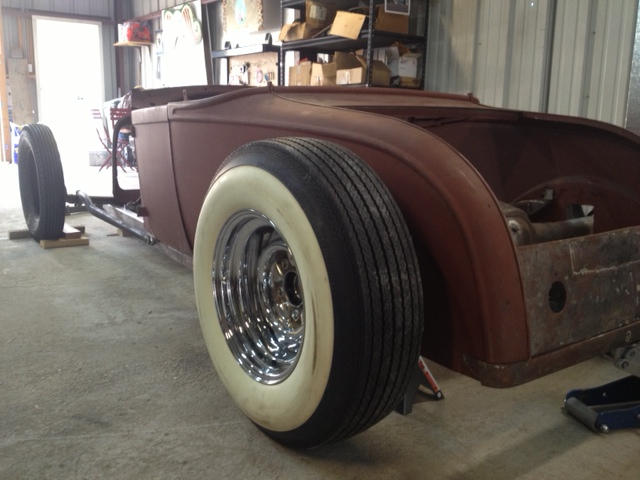 We're also experimenting with front tires to make sure we get the visual rake The challenge is figuring out the ideal front tire to fit on the 5.5 inch front chrome reverses, and making sure that tire has a wide enough whitewall to compliment the rear tires. Once we get the front tires figured out, we'll be setting up the front suspension, too.